This is the second year we have hunted together. Jon O. has our gratitude for the set up and maintenance of the multiple stands and we always give Marty the best spot in the tripod. 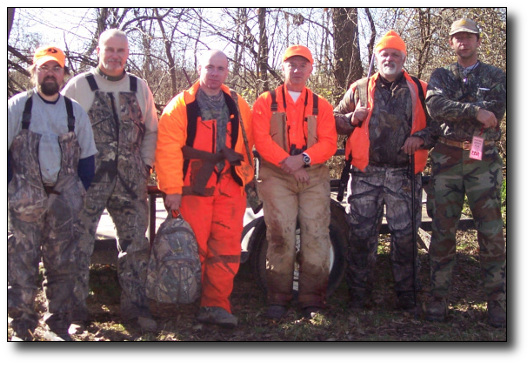 We enjoy the hunting, the outdoors and the camaraderie around the lunch table. 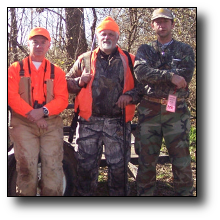 We are all dedicated deer hunters including firearm, muzzleloader and archery. Even with the opening day weather, we climbed our stands in the morning darkness and stayed until dusk. We are off to a bit of a slow start this year. However, last year we harvested several does and three bucks, two of which were very respectable. With the blessing of Artemis, we are looking forward to an excellent closing weekend. The core group above has hunted together for several years. This year Chad (DeerSlayer) P. joined us and we're glad to have him. If we ever decide to incorporate, the group will probably be called The Missouri Mess LLC. Only the least photogenic are shown in the photograph. The two really beautiful members are missing; namely, SureShot Lora W. who took the picture and me, the patriarch, Mighty Mean Mad Martin. The size of our group varies. Next year it could be just four or forty four. With us camaraderie is the big thing, just one step ahead of food. I sometimes think most show up just for the lunches. Occasionally we shoot a deer just to keep Nadlers and other processors in business. Someday we might just luck into a big one. So far we've been shooting small deer to keep the dragging easy. One interesting sidelight might be that of the eight rifles involved, four of us shoot Tikka T3s. Left to right: Eric S., Don K., Chad P., Philip J., Jon O. and Randy N.. Our group numbers eight. Missing was sure-shot Lora W. who took the photo. Also missing but very deserving is Honorable-mention ("mad") Marty H.. Marty is our patriarch, 79 years old and an inspiration to us all.